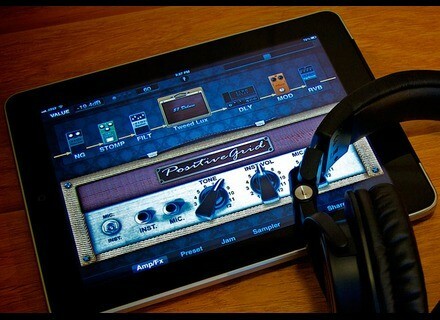 I use it on an iPad 2, mainly to work with headphones, but sometimes in rehearsal to color my sound (I'm bassist). The audio interface I use is a Griffin Studio Connect. No compatibility issues between the two. It is a universal app, but I have not tested it on the iPhone. I tested a lot of tools like: AmpliTube, AmpKit ... but this is really the app that has me more convinced of his point of view. 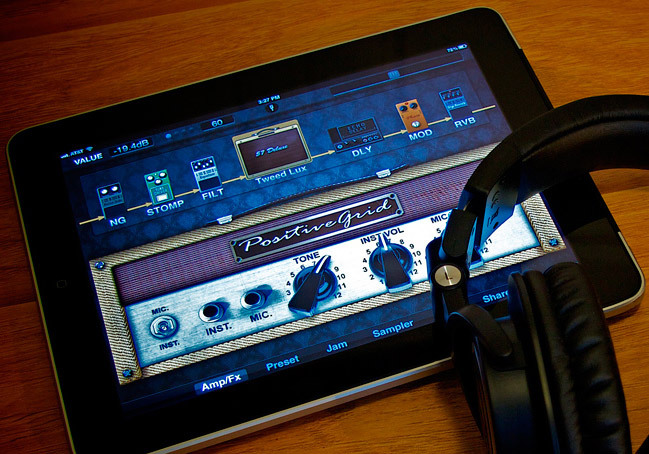 The app is about $ 15, but comes with a small selection of amps and effects. And as is the case for each of these applications, the rest comes next to bundles in in-app purchase. Finally, the full version is around € 70, after that I do not regret having spent gradually (although some bundles have not much helped me . The ergonomics are excellent, super simple to use. The app is very stable, I do not remember (like AmpliTube for example) to have been planted one day in the middle of a session. The doc is useless if it exists, everything is understood intuitively, it is only to turn knobs, buttons to play or record pedals preset organized in banks, in short anything that is foreign to a musician. The updates are rather frequent, and bassists are not forgotten, with bundles amps / dedicated to instrument effects. This is the strong point of the application, in comparison to others that I've tested: the sound is very convincing, either through headphones or effects processor between the bass and the amp. I recall here that I use the interface Griffin Studio Connect, which induces the breath and grabs some interference, but still, you get to make things nice with the app. (I'll edit this review when I tested my scarlett). The settings are simple and it is always very easy to find her. The resulting sounds are varied, including the bass, it was really the simulation models that allow you to go on all styles. The application is rich in potential export: AudioCopy, AudioBus, SoundCloud, iTunes, and a clean app network that lets you share settings or try those other users. And it is possible to connect a pedal noon to control almost all parameters (on this point Amplitube seems best, with the opportunity to learn what the app will run twelve o'clock signals). I use it for a good year and a half daily. To work in this headphone is an amazing tool. I tried Amplitube depth (having bought all the add-ins), and I much prefer Jam Up, except for the DAW is best managed on Amplitube. The feature I like most: the sound! The least ... beh difficult to find her real defects. The value for money is excellent, and of course with the experience I remake this choice (I do not say the same Amplitube for example).